During Operation Spirit of Freedom ADI assisted the governments of Peru and Colombia with enforcement of new laws prohibiting wild animals in circuses. 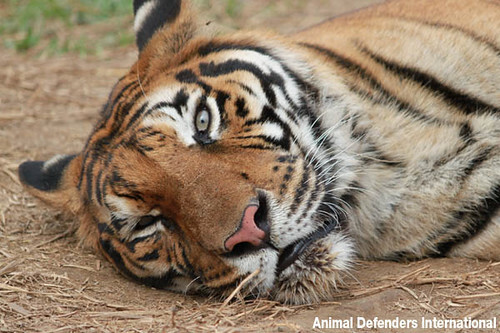 Over an 18-month period, over 100 animals were saved and an entire cruel industry eliminated. Meet the animals relocated to sanctuaries in their native environments and even returned to the wild. Before they headed to their forever homes, the animals were cared for at the ADI rescue center near Lima, Peru – a temporary facility where our specialist veterinary team nursed the animals back to better health and introduced individuals to suitable social groups where they could experience the companionship of their own kind. Our rescued animals were also provided with a proper diet and the enrichment they needed to keep them happy, healthy and active! Home for the 33 lions rescued by ADI from circuses in Peru and Colombia, Emoya Big Cat Sanctuary is set on 5,000 acres in Limpopo Province, South Africa. Relocated to their native homeland, the lions enjoy natural habitats in pristine African bush. The lions would not survive in the wild – almost all have been mutilated to remove their claws, one has lost an eye, another is almost blind, and many have smashed and broken teeth. For news and updates visit our Lions Back to Africa site. Watch how 33 lions went home to Africa. Macaw James – who is now flying free! The last animals to be rescued during the ADI mission were relocated to Tamushal, a beautiful rescue center in Cordillera Escalera and situated in 150,000 hectares of protected land outside of Tarapoto, Peru. 4 parrots, 2 condors, 2 terrapins, a fox, iguana, kinkajou, tortoise, and 11 cats.